The Cotswolds are a range of hills covering an area of 25 miles across and 90 miles long and lie mainly within the counties of Gloucestershire and Oxfordshire but extend into parts of Wiltshire, Somerset, Worcestershire and Warwickshire. The spine of the Cotswolds runs southwest to northeast through the six counties particularly Gloucestershire, west Oxfordshire and south western Warwickshire. The Cotswolds have been designated as the Cotswold Area of Outstanding Natural Beauty and is the largest AONB in England and Wales. 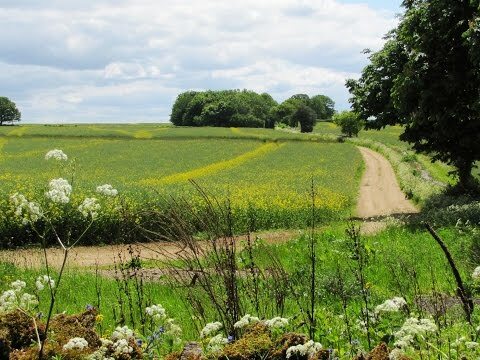 The northern and western edges of the Cotswolds are marked by steep escarpments down to the Severn Valley and the Warwickshire Avon and this escarpment is often called the Cotswolds Edge. On the eastern boundary lies the city of Oxford and on the west is Stroud. To the southeast the upper reaches of the Thames Valley and towns such as Lechlade, Tetbury and Fairford mark the limit of this region and to the south the boundary reaches beyond Bath and towns such as Chipping Sodbury and Marshfield. The Cotswolds are characterised by attractive small towns and villages built of the underlying Cotswold stone, a yellow limestone, and drystone walls many built in the 18th and 19th centuries can be seen everywhere in the fields. The most well known towns or villages are Bourton-on-the-Water, Broadway, Burford, Chipping Norton, Cirencester, Moreton-in-Marsh, Northleach, Stow-on-the-Wold, Stroud and Winchcombe. During the 13th – 15th centuries the native Cotswold sheep were famous throughout Europe for their heavy fleeces and high quality of wool. Cotswold wool came at a high price and the wealth generated by the wool trade enabled wealthy traders to leave their mark by building fine houses and beautiful churches, known as “wool churches”. Today the sight of the sheep on the hillside is still one of the most common features of the Cotswolds. Burford is a wonderful town and is considered the southern gateway to the Cotswolds. At the top of the towns High Street, which slopes down from the high Wolds, there are wonderful views of the open country side in the pretty Windrush Valley. At the foot of the hill is a lovely three arched medieval bridge that crosses the River Windrush. The street is lined with old houses and ancient cottages and many of the shops have little changed since Tudor times as can be seen by the angle at which the buildings have come to rest. There are some lovely side streets to explore, old pubs and plenty of antique and tea shops. Burford was the site of a fortified fort in Anglo-Saxon times and grew to be an important crossroads and very wealthy wool town. The magnificent 15th century church of St John the Baptist is a sign of past riches in the wool trade. The town’s museum, The Tolsey, an early Tudor building on stone pillars is where wool merchants would meet to do their trading. Swinbrook is a small attractive village situated on the River Windrush about 2 miles east of Burford. This quiet village with its stone walls and buildings, pretty church, cricket pitch with wooden pavilion and an old stone pub next to the old stone bridge across the River Windrush is said to have been untouched for generations. The River Windrush which winds through the rushes for much of its course, hence its name is a stream and river in the upper Thames catchment. Its source is in the Cotswold Hills northeast of Taddington in Gloucestershire and flows for about 35 miles through Bourton-on-the Water by the village of Windrush then into Oxfordshire and through Burford, Witney, Ducklington and Standlake before it meets the River Thames at Newbridge. The rivers waters from the mid 17th century were used in cloth and woollen blanket making in Witney. Many fish including trout, grayling, perch, chub, roach and dace can be found in the river and until the 1980’s there was a good population of native crayfish. From the monument on the hill we walk down the High Street to cross the bridge over the River Windrush. At the roundabout we turn right and follow the main road, using the pavement, towards Fulbrook. Just before the bus stop turn right at the footpath sign then turn left at the fence with a yellow arrow. Head forwards to the end of the buildings then turn left over the stile. Follow the narrow path and then the tarmac lane to meet the main road. We cross over the road and head to the church. We walk through the churchyard to the left of the church and cross over the stile next to the seat. We walk through the fields bearing right to a track. We turn right then left onto the main road. We walk forward for a short way and turn right through the gate at the footpath sign. We go up some steps then follow the track through the fields, going through a tall hedge, until we reach a wood. We turn right and follow the track through the wood. We soon come out into the open and follow the track. We pass a white farm and head to the buildings then bear off right along the tarmac road then at the t-junction we turn left. We follow the minor road for about 5 minutes or so then after passing a disused quarry we turn right at the sign post Bridleway leading to Byway. We head forwards along the track to a minor road. We cross straight over and head forwards on the minor road signposted Asthall. We keep to the road and just before the stone bridge we turn right following the River Windrush on our left through the fields towards Swinbrook. After passing a house on our left we go over the stile and come out onto the road at the pub. We turn right and follow the road through Swinbrook turning left at the post box. We head forwards down the lane the church is on our right then to the left of a house. We go through a gate turn left then right between the two walls. We go through a gate and head forwards following the track through the fields passing a church on our right until we come to a minor road. We turn left to cross over the bridge then turn right at the road. We follow the road for a few minutes then turn right at the footpath sign along a path between hedges. We soon come out into the open with the river now on our right. We keep following the path and the river through the fields until we come to a road. We cross the stile, turn right and follow the road using the path then the pavement back into Burford. This is an easy walk on grassy and gravel paths and tracks, two short stretches of minor road and two main roads with pavements. Elevation: Approx lowest point 92.3m (302.8ft) approx highest point 166.8m (547.2ft) ascent 155.6m (510.5ft). Approx 7.6 miles allow 3 hours using OS Explorer Map OL24, The Cotswolds, Burford, Chipping Campden, Cirencester & Stow-on-the-Wold. Start point: Free car park at the back of the church. Burford is in the Cotswolds, Gloucestershire. From the M40 take junction 15 then take the A429. About a mile after passing through Stow-on-the-Wold take the left turn onto the A424 to Burford. Parking: free car park at the back of the church and also some roadside parking with restricted hours. There are public toilets in the car park and also on the main street. For refreshments there are a number of shops, cafes and pubs. There are also two pubs at Fulbrook, one pub at Asthall and one at Swinbrook.